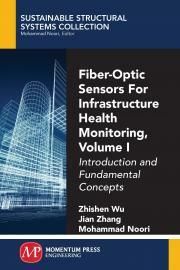 The book focuses on advanced techniques that utilize fiber-optic long-gauge sensing and overcome the limitations of traditional sensing and fulfill the requirements of infrastructure systems. The long-gauge FOSs have the merit of revealing both micro- and macrolevel information. Subsequently, a new approach, areawise distributed monitoring, is thoroughly discussed and its superior performance in SHM demonstrated. Finally, the application of areawise distributed monitoring, combined with the aforementioned long-gauge sensing technique, is presented for groups and networks of complex infrastructure systems. Zhishen Wu is a professor at Southeast University, China and Ibaraki University, Japan. He is the president of the International Society for Structural Health Monitoring of Intelligent Infrastructure and the chief editor of the International Journal of Sustainable Materials and Struc¬tural Systems. He is a member of the Engineering Academy of Japan and a fellow of ASCE, JSCE, ISHMII, and IIFC. Jian Zhang is a professor at Southeast University. He is a recognized researcher in structural health monitoring of bridges. He serves on the editorial board of the Structural Control and Health Monitoring Journal and is a recipient of the 1000 Program Distinguished Expert Young Scholar and Jiangsu Science Fund for Outstanding Young Scholars. Mohammad Noori, a recognized researcher in AI techniques for struc¬tural health monitoring, and random vibrations, is an ASME Fellow and professor of mechanical engineering, at California Polytechnic State University. He has also been a distinguished visiting professor at South¬east University, in China and a recipient of Japan Society for Promotion of Science fellowship.